Why most DIY Fibreglass Pool Kits are a Heap of Garbage! Avoid getting caught! So many of the Cheap Fibreglass Pools on the market today are made for the cheapest price possible. When most of your costs are going to transport and not the materials that go into it. While they may look good in a picture, what turns up and you subsequently install could quickly turn into a nightmare. Compass Pools offers the Silverline Carbon Ceramic range, the perfect choice for your new DIY swimming pool. Specially designed to be ideal for home DIY installation, this can be a fantastic project for your home with the peace of mind that you are received an exceptionally high quality fibreglass pool from Compass Pools. This is an ideal choice if you want the fun and challenge of a DIY pool as well as the reliability and durability of our models ensure that you will end up with a wonderful pool the whole family can enjoy. For more details you can get in touch with us today. When you choose Compass Pools you will get a truly first class fibreglass pool. Our pools are manufactured in a humidity-controlled factory to the highest standards. This ensures that your pool will be long-lasting and very cost effective compared to choosing a cheaper, inferior quality product. Additionally, our pools can be heated to a higher temperature than other models, which often have a limit of 30 degrees before the pool starts to blister. 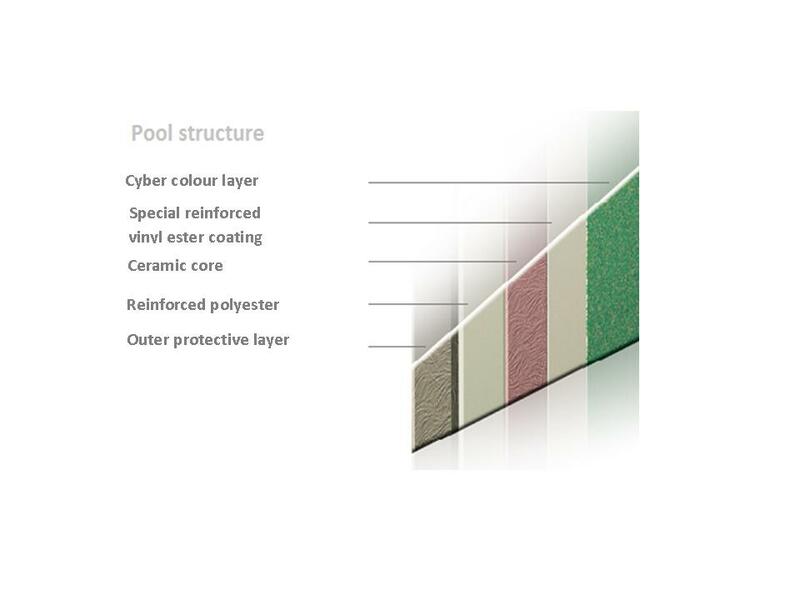 Some pool manufacturers also have designs where the gelcoat will be in contact with water which means that the pool will become discoloured by the chlorine. We offer a more carefully designed product to provide a better lifespan. If you have always wanted your own pool, building one as a DIY project can be an extremely satisfying endeavour. It is not a simple task and will take planning and forethought, but our team would be happy to provide you with guidance and information to ensure that the whole of the build runs smoothly. Depending on how confident you feel about building your own pool, you can choose to contact one of our Compass engineers to provide help with the project. It is possible to hire for a day, a week or for as long as you need to complete the pool. Why choose a DIY pool from Compass Pools? At Compass Pools, we pride ourselves not only on providing you with a stunning pool for your property, but also expert advice and superb customer service. Here are some of the key reasons that an increasing number of Compass Pools customers are choosing a Silverline model and handling the DIY installation of their pool by themselves. If you are interested in learning more about the Silverline range of pools or you would like a free, no obligation quote, please don’t hesitate to contact Compass Pools today. Call us on 0333 4567 111 or send us a message at info@compass-pools.co.uk. Our team would be happy to provide any information you have need on buying and installing your DIY swimming pool. Installing a Pool as a DIY project can be daunting, but we have engineers on hand for as little as a day to as much as a week. Aqua ceramic pool is ideal for great fun in a small space. Its compact design and dimensions make it ideal for smaller houses. Optionally equipped with counter current it provides the owner a place to exercise and enjoy. Built-in staircase with non-slip surface together with a security platform around the perimeter and a built-in safety hand rail contribute to the maximum possible security for small children and animals. Cleaning Kit: Pole, net, vac, hose. Your own sanctuary in the garden, with the ceramic pool Trend model. Wide and comfortable staircase with a non-slip surface, this ensures easy entry and exit for the young and old. With a Length of more than eight meters, it is a great area for sports and games. Security platform and hand rail on the longitudinal sides provide a sense of safety and comfort for all. For those with the space, this is an ideal shape and dimensions for all homes. Transform your Fibreglass Pool with a multicolored led light as standard on all Compass Silverline Pools. As an option we can upgrade to full iPhone or wifi control. The most important part, come down to the showroom and choose your pool! 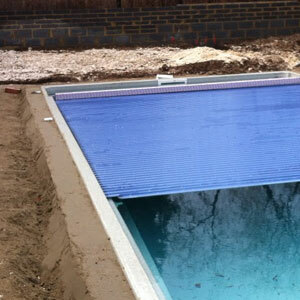 The first step in the install process is to mark out on the ground the size of the pool and the finished level, you will mark out an overdig to allow for backfill, you will then excavate to the depth of the pool plus room for backfill along with a trench for the services to the plant room. Once the hole is dug, you will then order in a lorry of micro concrete / stabalised sand / screed mix to lay the base of the pool in the bottom of the hole. Its a good idea to hire in a laser from a hire shop to enable you to get this spot on. The pool will be pre plumbed with all its fittings into the shell, you will be supplied with 25m rolls of flexible pipework that need running in the trench you dug earlier. There are 3 fittings on the pool shell to glue the pipe to (glue supplied). You can then backfill the pipes with builders sand to protect them. The filtration system will either come as a pre plumbed box, or as component parts to be fitted into a shed or outbuilding. Its your option. The 3 pipes from the pool and lighting cables will be attached to this. We can hire a pressure testing kit to you to ensure you did everything correctly. Alternatively hire one of our engineers. Once the pool is all plumbed up its now time to backfill the pool with screed mix, this is done by machine, barrow or pump. Its a 1-2 day job carefully packing all the crevices to ensure you have a strong shell. Its now ready to put the hose in, 1-3 days depending on your water pressure and you will be ready to power up. Now its full of water, its just a case of powering up the filtration system, testing and you are away. Allow a few days to heat up depending on the heat source you have specified. Backfill - Approx £50-£75 per tonne. Amount depends on accuracy of hole. The Silverline DIY range is available in an excludive limited edition Compass Cyber Blue, this rich blue colour benifits from the Compass Clear Protection Coat and gives the water a colour depth that is unparalelled with silver metalic fleks that catch the light to make the water sparkle. Why not come down to the UK Compass pools showroom, swim in a pool and discuss your installation?